The Pyramid is recognized as the as the largest pyramid in volume with four million five hundred thousand cubic meters. It literally DWARFS the Great Pyramid of Giza.Experts estimate that it took around 1000 years for the Pyramid to be built. It is also so far, the largest monument ever built in the world, among all ancient civilizations. It still remains a mystery as to WHO built the Pyramid. The Great Pyramid of Cholula or Tlachihualtepetl –from the Nahuatl meaning “handmade hill”— is the largest pyramidal basement in the world with 450 meters per side. In fact, it is not a single pyramid at all, but one monument stacked on top of another, consisting of at least six buildings. It grew in stages, as successive civilizations improved what had already been built. With 450 meters wide and 66 meters high, the Great Pyramid of Cholula is equivalent to nine Olympic swimming pools. However, the Great Pyramid of Cholula has an impressive list of records: it is the largest pyramid on Earth, with a base four times larger than the Great Pyramid of Giza and almost double the volume. It is also so far, the largest monument ever built in the world, among all civilizations. 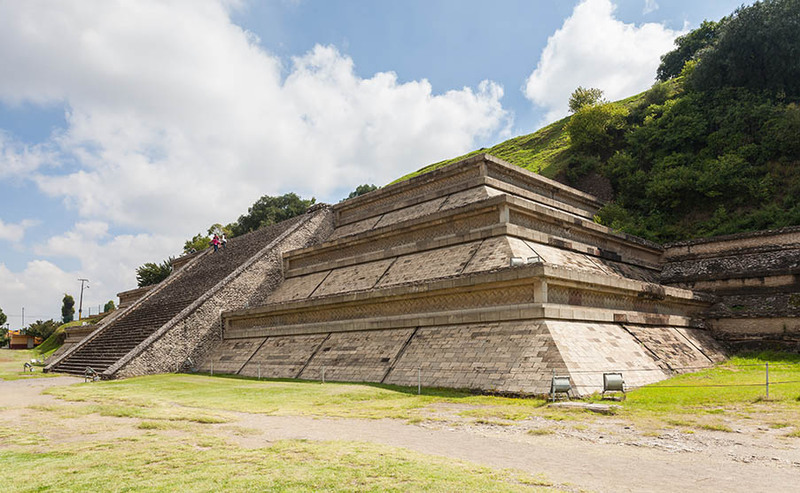 Curiously, It is also officially recognized as the largest pyramid in volume with 4,500,000 m³, but it is not the tallest one; With 65 m high the Great Pyramid of Cholula is similar to that of the Pyramid of the Sun in Teotihuacan which has 64, while the Great Pyramid of Giza In Egypt it has a height of 139. While experts are unsure as to when exactly the Pyramid building process was begun, archaeologists believe it was around 300 BC or at the beginning of the Christian era. It is estimated that it took between 500 and 1000 years until the pyramid was finished. According to legend, when the local inhabitants heard that the Spanish Conquistadores were approaching, the locals covered the sacred temple with dirt. 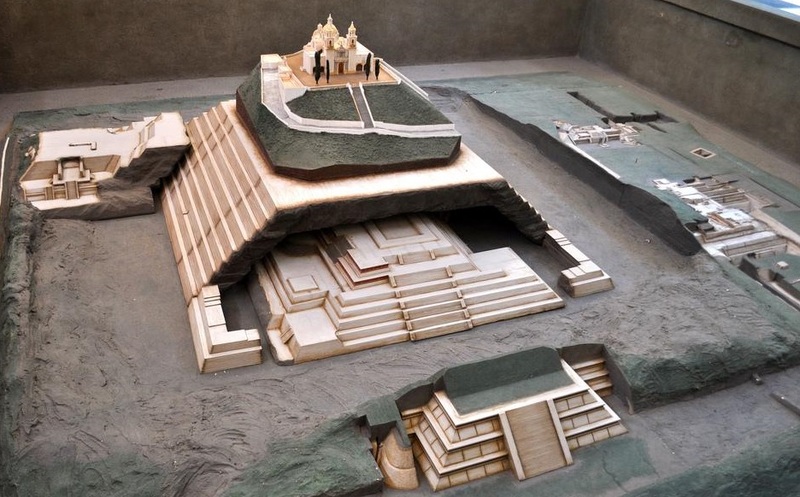 When Cortes and his men arrived in Cholula in October 1519, some 1,800 years after the pyramid was built, they massacred about 3,000 people in a single hour, 10% of the entire population of the city, and leveled many of their Religious structures. The Pyramid is a mind-bending structure, and it is so old that when Cortes and his men arrived in Mexico, the monument was already thousands of years old and completely covered by vegetation. Strangely, first on-site excavations revealed a series of horrifying discoveries, including deformed skulls of decapitated children. Curiously, little is known about the initial history of the pyramid. It is thought that construction began around 300 BC, but it remains a mystery who erected it. According to legends, the great Pyramid of Cholula was built by giants. Archaeologists estimate that the Cholutecas participated in the construction.